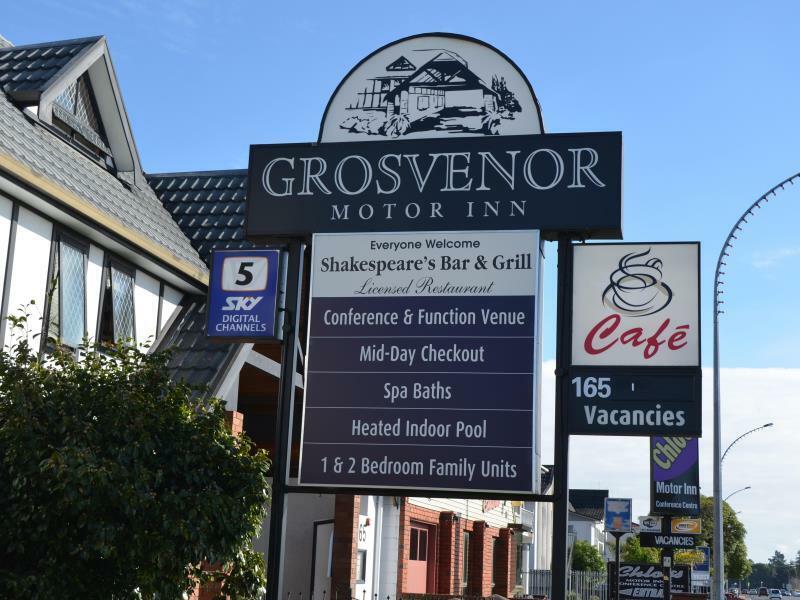 يضمن فندق Grosvenor Motor Inn الذي رمم في 2015 لزائريه قضاء وقت ممتع في هاملتون، سواء جاؤوا في رحلة عمل أو سياحة. لا يبعد الفندق كثيراً عن مركز المدينة، فهو يقع على بعد 1 Km منها. في حين يستغرق الطريق منها إلى المطار حوالي 15 دقيقة. يضفي محيط الفندق اللطيف وقربه من ‪Riff Raff Statue‬, ‪Waikato Stadium‬, ديبارتمنت اوف كونسرفيشن سحراً خاصاً على هذا الفندق. يعمل Grosvenor Motor Inn على ضمان إقامة مريحة لضيوفه من خلال خدماته الممتازة وحسن ضيافته. يقدم هذا الفندق العديد من الخدمات الكفيلة بإرضاء أكثر الضيوف تطلباً. تنعكس أجواء Grosvenor Motor Inn في غرف الضيوف.تلفزيون بشاشة مسطحة, اتصال لاسلكي بشبكة الإنترنت (مجاني), حوض الاسترخاء, غرف لغير المدخنين, تدفئة هي بعض الميزات الموجود في العديد من الغرف. كما أن مجموعة الخدمات الواسعة الموجودة في الفندق لضمان راحتك تترك لك الكثير من الخيارات لقضاء وقتك أثناء فترة إقامتك. استمتع بخدمات لا يعلى عليها وعنوان ذو اعتبار في Grosvenor Motor Inn . We are a family of 6 that booked two rooms. One room was alright but the other room was under standard. It had lacking towels and when we asked we were told that they were still in the laundry. Our room had no latch on the door and no blinds to cover the window. The soap dispenser in the shower was broken and there was no dispenser for toilet roll. All these are little things but thethotel hotel manager should then charge less for a room that is lacking these facilities. OK. But our room at first floor, not suitable with many and big luggage. Need to climb stair with those luggage. Due to the farmers even going on this was the only Hotel room we could get in Hamilton on that date and I had very low expectations. As I walked into the room there was a cockroach on the wall, I pointed this out to the guy at reception who proptly removed it and said "this isn't good". I agree. Then I went to the bathroom to have a look at the big spa tub and saw that all the plugs were removed so that people couldn't actually have a bath in the spa tub. It took me a while to work up the courage to get into bed and was grateful for my 4 am wake up call for the early flight to Christchurch. Never again. This is a pretty standard roadside hotel located just outside the centre of town Z(approx 15 min walk). It's a little old and tired but was warm, had a good shower and plenty of space. It was clean and the staff were helpful and friendly. Old decor but fitted the price. Comfortable enough for a budget motel. If you like sleeping in the dark, do not stay here. The lights from outside the window shine straight through the curtains and it's very light in the room, all night. First we got booked in a room with water damage and a leaking toilet. That was a bit of a downer, but they were flexible enough to give us another room. I wish they would have given us another room straight away, shifting rooms during an already short stay is not what we wanted to do during our vacation. We paid for the breakfast only to find only bread and cereals. No hot breakfast. The manager told us that no one was working in the kitchen but took our money from the prepaid reservation anyway. Room was so dirty from construction dust nearby. I don't know why it is overated. Location is quite far from the city center as well. We were just a couple. The beds were not clean and had flees in it so we could not sleep whole night as we were scratching our skins whole night and felt so itchy . Would never recommend this hotel again. We got there and even with confirmation papers they did not have a room for us or anyone else in our party. We all booked through different booking agents. They said it was Agoda that was the problem...I think not! The they said they would not help us find alternative accommodation. Never again. Some friends were squeezed into a room and they had the lining fall off the shower, toilet brush looked like it had vomit on it, one even woke up with bed bug bights. This place should be shut down! Suspect it is used by prostitututes, staff did nothing to help after being harassed by neighbouring room.